I-Link provides a range of Quality Assurance and Testing services to help clients manage software integration and testing including independent verification and validation (IV&V) support services. Our testing services are backed by a formal methodology, based upon best practices, to ensure testing is not an afterthought. I-Link's approach to QA and Testing begins at the start of the development process and is an integral part of the software development lifecycle. 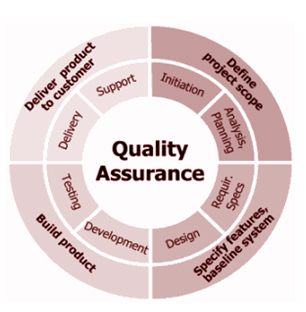 I-Link’s software development and QA process consists of incorporating the best practices and technologies throughout the entire product development, testing, evaluation and release cycle. Our aim is to reduce the business and technical risks associated with the development and operation. The quality of the testing effort is one of the most crucial factors in determining the success or failure of an IT system. To keep up with the increasingly complex nature of today's systems the testing and quality assurance program needs to be more stringent and exhaustive than ever before. Our testing methodology encompasses all areas of software and hardware testing, ensuring your software meets the functional and technical requirements that are critical to its success. Testing is an essential part of the software development life cycle. It is a way of validating that requirements are implemented as specified and verifies if a solution meets a client's functional and technical expectations. Our testing services are tailor designed according to the customer's needs and plans, either as a complete solution or a partial operational solution. Our methodology is designed to prevent defects from occurring, thereby producing quality software, reducing costs, increasing speed to market, and improving end-user satisfaction.